Noob member here! Great trees on the site and looks to be a wealth of knowledge here as well. I live around Tallahassee, FL. Looks like Jim's old stomping grounds but do now know him. I've started to collect some trees by way of yamadori, local nurseries, gifts from a friend and the local club for my growing collection of very very very pre-bonsai material. Everything has been deciduous except for a juniperus virginiana that may or may not make it to a bonsai pot one day. Everything is planted in oversized pots to mature a while. Some of these will be moved to a raised bed by this time next year. I realize there is no pine in panhandle of Florida that makes great bonsai material and this experiment could be a huge waste of my time. That being said I'm going to try anyway. I know there is tons of information about the JBP, mugo and other more traditional/popular pines out there but I want to concentrate on local species because they are the trees I know and love! There are two species of pine that I would like to collect during late summer. The first is what I think is the Shortleaf Pine the second is the Spruce Pine. Both these species have relatively short needles and both grow locally in great numbers. These would likely be styled in more of a medium size bonsai such as 24 - 36 inches (46 - 91 cm). I've got what I think is one of the shortleaf pines already marked. It's still only about a foot tall with lots of branching down low growing in full sun. The needles are only about an inch long in clusters of 3 so I'm not completely 100% on it being a short needle but it's the closest match I've been able to find based on needle length and cluster number. I was planning on treating these like the JBP as far as what to do and what time of year to do it. Anyone think this is bad plan or have any fist hand experience with any pines similar to the Shortleaf or Spruce Pines? Both of these will make decent bonsai. I'd suggest concentrating o the Shortleaf pine (Pinus echinata) rather than the spruce pine, though because te bark on the spruce pine is quite boring. FYI, though, P. echinata needles are USUALLY in pairs and only occasionally in threes. 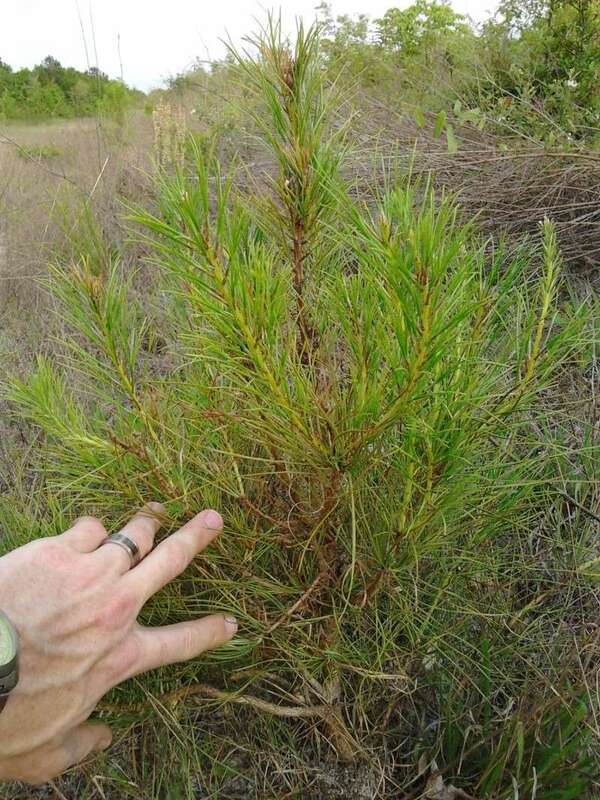 Spruce pine needles can be smaller than shortleaf pine, but they're thinner, too and not as attractive. I do wonder where you have found spruce pine in "great numbers" around Tallahassee. It is a tree of the hardwood forests and usually is limited to an isolated specimen or two in beech-magnolia climax woods. I think I had three of them on my 40 acres of woodlands in North Leon County. Don't ignore the loblolly pine P. taeda; you will occasionally find clumps of these with quite short needles and they do reduce. A blessing of the loblolly is that thay do backbud after severe pruning. Thanks for the reply Jim. I live on an acre in the Wakulla Springs area and have 3 large spruce pines in my yard. One of them is probably 6 foot in diameter. They are pretty common in the area but certainly not as common as other pines around. I have only been able to find smaller ones growing in the shade and none have the branch placement to make for a good project tree. I still have loads to learn. Being a young tree it may have much smaller needles than the mature pines or the same species so it may not be a shortleaf variety of pine all. I had read that they are normally found with 2 needles per cluster also. Looking at the pointed bud, it does look more like the P. Taeda than the P. Echinata (perhaps it just hadn't opened in the photo of the Echinata?). This is a photo of the pinch of needles I was trying to identify the tree with. I'll get a shot of the actual tree in the next couple of days. Those look like loblolly to me. With careful pinching of candles it can make a nice medium to large bonsai. You're a lot farther south than I was; all sandy soil, while I had all Georgia red clay. Jim, Thanks for the ID and the suggestion on the water elm. I've got a american hornbeam (ironwood) that will make a pretty good looking slant style one day but still has a long ways to fill out. I'll do more research on the loblolly. With the needle reduction being so drastic I didn't think it fit the descriptions online. Nice to hear you mention they can be nice bonsai trees and will back bud some. A friend also said they make pretty good trees to work with. Ok this is the pine that I was considering collecting. As you can see the trunk is still pretty small and not all that much movement in it but the tree has a lot of branches to work with. Like Jim suggested the plan for this would be like 30" or so maybe. One day 20 years from now I'd like it to resemble a tree like this...100 year old Scots Pine by Walter Pall. Not talking about the species of tree ever getting to look like the goal but this particular tree itself. 1. Would this tree make a fair choice to get to the goal or should I pass for an older tree even if it only had branching more at the top? 2. If this tree was collected what would be the best plan of action to reach the goal? a) Leave the tree as is to grow until reaching 40" or so. Remove the existing leader to get some taper. b) Select a few branches now that will stay either as sacrifice branches or branches to be part of the final design and remove the rest. Let the tree grow for a few years. c) Leave the branches right at the base of the trunk as sacrifice branches to get some size on the trunk. Remove the upper 2/3's of the branches except the leader for the tree to put energy towards achieving the height desired. This will be going in the ground even if collected. Just at my house so I can keep an eye on it. Hello Mike. To achieve a tree like the one posted, you need to start with material similar to that size. You can grow your little Pine in the ground to beef it up but it will take many years to achieve your desired size and appearance. If planted in the ground, it takes a lot of skill to produce good taper and branch setting. Give it a go though. Great question. I am looking forward to hearing others advice. I think the material has potential. My instinct would be to start by focusing on the roots when you transplant. Try to keep as many as possible since you are not trying to fit in a pot yet and put wire Tourniquets around any larger deeper roots that won't have any place in the final design. This will let the tree shed the roots at it's own pace and cause swelling near the base of the tree (right where you want it). I would also recommend planting in the ground in a pond basket (or wire mesh basket) so that every couple years you can rip out any roots that have become too long. Both of these techniques might be overkill, but I'm just throwing some ideas out there. Another question that I am curious to hear others comments on is: how should he reduce the whorls (multiple branches emanating from the same point on the trunk) in order to reduce the risk of inverse taper. I am studying the picture of the "goal bonsai" in 20 years and it looks like there are place where there are two and maybe three branches coming out at the same point, but it is hard to tell. Should sacrifice branches be avoided when they share a whorl with a branch intended for the final design? Sorry for the difficult young material in question and the photos could be better I know. Other than yamadori or trees dwarfed by nature which we don't really have here in North Florida other than a few sparse trees that are on the coast. Which I have begun to look for but haven't found anything promising yet. Normally by the time the tree is close to that size in diameter most of the shorter lower branches have already died off. I'll see if I can find a tree that's a couple years older with a good spread of branches. Mike, judging the candle growth, it is probably a little late for collecting. It would be better before they elongate. Do you mean for this season or that this tree is past the point of being a good tree to work with at all? Mike, late for this season. I'm sure he means the season. I am in central Florida southeast of Orlando. I have a Sand Pine, Pinus clausa as a bonsai. It's a two needle pine. It's very hard to collect due to very sparse and broadly distributed roots but it can make an interesting bonsai but not a JBP look alike. I've had mine about 11 years and it has doubled in trunk thickness and has developed interesting bark. Supposedly it is a short lived tree in the ground so we shall see how long it lasts in a pot. Another Florida native pine I have as a bonsai is a Slash Pine P. Elloitti. Very long 2 and 3 needle bundles. Its greatest feature is very rugged bark in a fairly young tree. Mine is about 14 years old. I am growing mine as a weeping bunjin. Normally a lumber tree with patience it can be grown into very contorted shapes but it will always have long (10-16 inch) needles. The bark however is absolutely superb. Both of these Florida pines like to receive a lot of water (more than JBP) and lots of fertilizer. I have kept these two trees for over 10 years but for some reason have been totally unsuccessful collecting others. There are a few other bonsai artists in North Florida with Sand Pine bonsai (very similar to Spruce Pine) but not many. It is a rare bonsai. A couple of people in south Florida have Slash Pine mostly as big bonsai. I'd love to see a Pinus echinata (Shortleaf Pine) (2 and 3 needle) as a bonsai. Years ago I styled a full size P. echinata on my Father-in-laws front lawn of his farm as a full size bonsai and it looked great. Try these different trees and don't be afraid to grow from seedlings. Florida trees grow rather quickly, in a decade you may have something impressive. Should sacrifice branches be avoided when they share a whorl with a branch intended for the final design? In general i think one should avoid more then one branch on the same hight. But it is not necessary to remove all at once, look closely how the taper is developing and act before a bulge is appearing. Thanks everyone for your input. Rob, sounds like you've had some pretty good success with your two native pines. I expect to be heading to one of the barrier islands today for a day in the sun and will scout around for some potential trees then. I know a few places where the sand pine (Pinus clausa) is the dominant pine so hopefully I'll be able to mark one of those for collection later on. Anyone have any idea about the summer dormancy I've heard about around August? Too risky to try or has anyone had success collecting pines during that time? I know it was 10 years ago Rob but if you can recall do you remember what time of year you collected your sand pine (Pinus clausa)? I don't mind waiting until late January if August is out of the picture. I have plenty to do between now and then. MikeT307 wrote: Thanks everyone for your input. Rob, sounds like you've had some pretty good success with your two native pines. I expect to be heading to one of the barrier islands today for a day in the sun and will scout around for some potential trees then. I know a few places where the sand pine (Pinus clausa) is the dominant pine so hopefully I'll be able to mark one of those for collection later on. Try ground layering the pines to assist with the success in collecting. Mine was collected in January (semi-dormant period). That is also when I repot. I acquired a pine when I lived in New Orleans, and I was told it is a clausa. I was very attracted to the needle color. Now I have moved to Virginia Beach a year and a half ago. I have had this tree for almost 3-4 yrs but it has always looked very unhappy, not vigorous, a lot of browning of needles, very sparse needles, random die back of small branches. The tree was planted in a regular 2 gallon planter and was severely root bound when I first got it, but I did not have enough courage to repot and trim the roots. Finally this spring I did repot but I was not very aggressive about trimming roots. Is there anything else I can do to make this guy heathy. How doy you treat it as far as general care? like JBP or white pines? what type of soil do you use? Any other advise is appreciated. 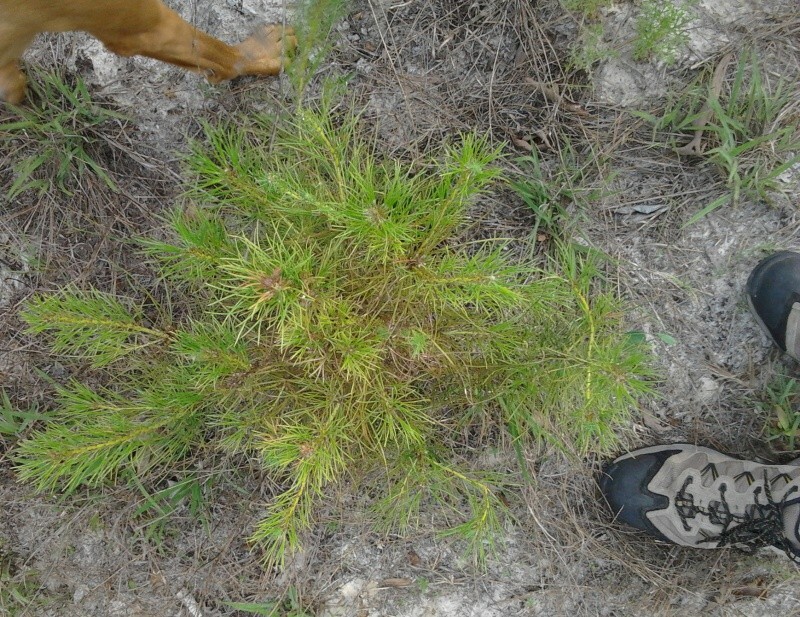 I hope I do not offend anybody by starting a new topic in this thread, I thought it is related to Florida native pine so it is OK. I'm afraid I have no input on the care of your pine but just wanted to say this isn't "my" thread. I hope others with experience with the native pines will chime in too. Think sand dunes for the Pinus clausa in sandy, infertile, dry soil...at least in this area. Hopefully Rob will be able to provide some care tips from his experience with them as bonsai.